Try Continuous Ink System with your Brother DCP-375CW and make 30 times more quality prints for the same money! Pay only 0.04 USD for A-4 full color print! Do printing, copying and scanning of color documents and photos with this compact and design multifunctional device and do-it-yourself. Inkjet printer is equipped with installed wireless interface Wi-Fi and card reader, which performs high-definition pictures printing, directly from memory card. Inkjet printer's usability, its high printing rate and its high-definition of printing, make this device ideal for work, home and small home-office use. Why Continuous Ink Supply System is so necessary? Continuous Ink Supply System (CISS brother dcp-375cw) is an up-to-date device, used in inkjet printer to turn ink directly on head of printer from refilled vessels. If system CISS for brother dcp-375cw is installed, then user has got a quite reasonable percent of economy when color inkjet printing is running. Special reservoirs are composition of this device and are joined with original cartridges by thin silicon flat tube; where through the cartridge of printing device, is supplied with ink and printing head respectively. In comparison with the use of standard original cartridges, the use of Continuous Ink Supply helps to reach essential savings, up to 30 times. 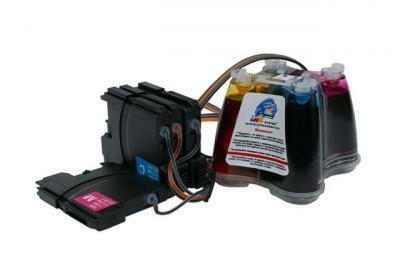 Now you can buy bulk ink system for brother dcp-375cw both for printer, and for printing devices of other brands. Many manufacturers have become more active and have been gone keenly into production of such systems, because the rapid development of inkjet printing demands devices' technology growth. Therefore, installation of Continuous Ink Supply System CISS for dcp-375cw on any printer model, becomes an more and mare attractive offer for users, because you know that there are a lot printer models at the market and any user can assort exactly what he needs. It is hard to escape a conclusion that the use of CISS dcp-375cw allows to cut time and money costs as much as possible. Unessential disadvantages of present system do not pay any important role, in comparison with numerous advantages of such type of device. Usually, it is desirable and reasonable to use at ink jet printers with printing head installed both cis brother dcp-375cw model and neighboring models of homothetic systems, such as CISS for brother mfc-495cw and CISS for brother dcp-6690cw. This, first of all, is determined by printing head's high service life, although as a matter of principle, system CISS ink system brother dcp-375cw can be installed even to the printer with removable printing head, placed in the cartridge.